As he works to add letters to the existing four-base genetic alphabet, chemist Steven Benner, at the Foundation For Applied Molecular Evolution, is synthesizing new forms of DNA and RNA that can support Darwinism, the mechanism for evolution that is perhaps the universal characteristic of biology. Historian of science Luis Campos, an associate professor at the University of New Mexico, has been relating the field of synthetic biology to its larger historical and cultural contexts since SB1.0, the field’s first international conference in 2004. Following his interest in astrobiology—the study of the origins and evolution of life on Earth and perhaps elsewhere in the universe—Campos was the NASA Baruch S. Blumberg Chair of Astrobiology at the Library of Congress from 2016 to 2017. In this conversation, Benner and Campos consider the social and scientific contingencies of the biology we have, and how life potentially existing on other planets or moons might be “other” already. Biology’s possibility space reminds us that we can go beyond pragmatic reinvention of industrial processes. As scientists rewrite life as we know it, science and speculation begin to merge. Can fiction provide other ways of thinking to help us reimagine the world? And what precedents can history reveal as we imagine what else is possible? Luis Campos: How do we constrain our speculations about “other biological futures,” either those that we might find, or that we might engineer in the laboratory? Over the last year at the Library of Congress, I explored these questions in my project "Life As It Could Be. Astrobiology, Synthetic Biology, and the Future of Life." I was interested in finding points of historical connection between these fields, between discovery and invention, and in telling a new story —a story perhaps not entirely familiar to scientists today, but one deeply grounded in the strange bedfellows of history. Let me set up some context and then we’ll dive into the conversation. 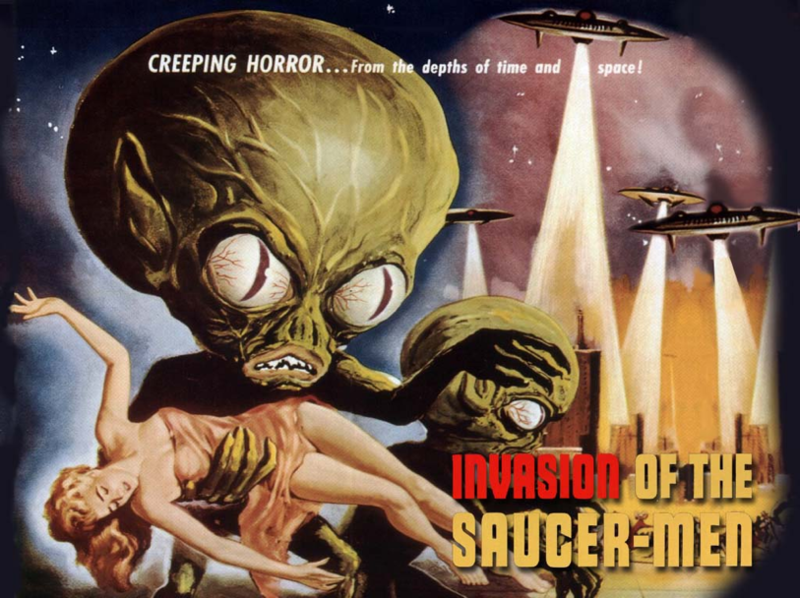 The classic trope of alien life envisioned in humanoid form, from the movie Invasion of the Saucer-Men, 1957. Credit: poster by Albert Kallis. Amid this cultural cacophony about life as it could be, the paleontologist George Gaylord Simpson stood out as a contrarian. Despite being a self-described “addict” of science fiction, the idea that humanlike entities might also have emerged elsewhere in the universe struck him as so absurd, he titled his 1964 criticism, “The Nonprevalence of Humanoids.” Careful attention to evolution on Earth suggested that instead of a lock-step pattern of emergence from amoebas to people, the history of evolution was a history of contingency. For Simpson, being attentive to the actual history of evolution placed important constraints on any speculations about other biological futures… or other biological presents elsewhere: “Exobiology… [is] a curious development in view of the fact that this 'science' has yet to demonstrate that its subject matter exists!” he famously proclaimed. Other biologists saw contingency as an opening for reworking evolutionary fates rather than merely imposing constraints. The geneticist Hermann J. Muller, who won the Nobel Prize in 1946 for using X-rays to induce new mutants of fruit flies, took the long view of the history of life on Earth, and envisioned chromosomes as the “threads of destiny.” As he calculated rates of mutation as genetic errors were replicated over and over again, he began to argue for a better understanding of the structure and nature of the gene and claimed it was “the basis of life”—the ancestral approach to many forms of minimalist Darwinian evolution today. In fact, as early as 1921, Muller was lecturing to his students that genes probably played a key role in answering the question of the origin of life. Muller became a mentor to a young Carl Sagan. They went to science fiction conferences together and talked repeatedly about the limits of life—both in space and time and in their daily pursuits. Sagan even picked up on motifs he heard in Muller's lectures. 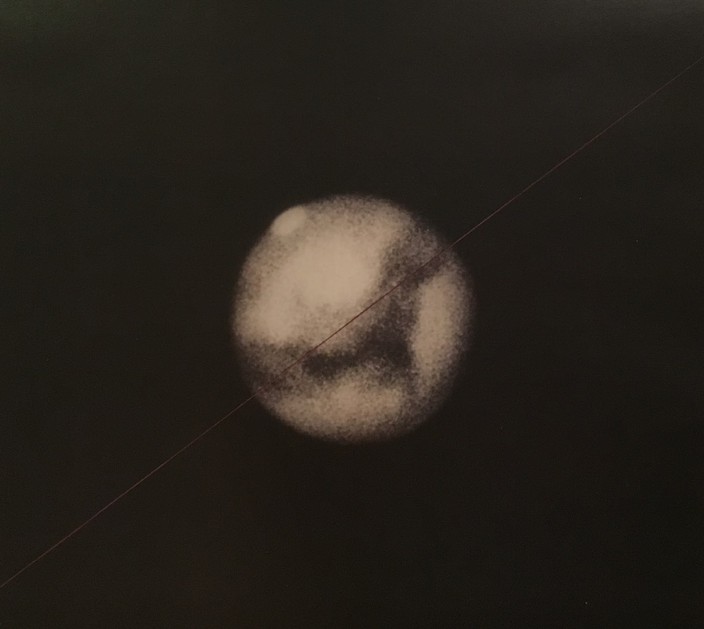 For Muller's birthday card one year, Sagan took a red thread, put it over a fuzzy image of Mars, and wrote on it, “the red thread slowly weaves its way upwards.” Sagan himself rewove Muller’s red thread toward new destinies. Carl Sagan’s birthday card to Hermann J. Muller from 1955, with red thread laid over Mars. Credit: Courtesy, Muller MSS., The Lilly Library, Indiana University, Bloomington, Indiana. In 1958, the year after Sputnik and two years before “exobiology” was coined, Sagan proclaimed to Muller that astrobiology was “coming of age.” And by the next year, he reported excitedly that life might be found even in the most unexpected of corners of the solar system. Whether the origin of life, its evolution by mutation, its ability to be engineered, or how it might exist elsewhere—the varied prospects for life that Muller and Sagan envisioned had become intertwined. For a historian of science, there’s nothing quite like discovering a connection between the quintessential geneticist of the age and the famed astrobiologist of the next generation, and uncovering an untold story of an early intersection of astrobiology and synthetic biology. Muller’s vision of the engineering of living systems opened up vistas for thinking about life elsewhere, no doubt. But I was also struck by the overlap at this time, rather than the distinction, between scientific speculation about “life as it could be” and the more radical science fiction visions of biological possibility at play both in their own conversations and in the larger culture. What I find most interesting about your work, Steve, is how you are extending Muller’s and Sagan’s red thread in new ways, using chemistry to explore new biological possibilities amid universal constraints. But I also noticed, when I read your book on Life, the Universe, and the Scientific Method, that your arguments are sprinkled with references to fiction: from Robert A. Heinlein, to Kurt Vonnegut, to Star Trek, or even to the movie Evolution. What does it mean to discover or engineer other biological futures with chemistry, and what is the role of speculation in this scientific process? Steven Benner: My laboratory has worked over the past two decades to create alternative genetic systems that can support Darwinism in the laboratory, but on molecular structures different from those that emerged naturally on Earth. One of the outcomes has been a molecular system that resembles natural DNA, but has as many as 12 independently replicating nucleotides, eight more information-coding “letters” than the genetic alphabet that all organisms have on Earth— at least the organisms that we know of. This activity has tested and developed our understanding of natural DNA, as well as supporting the search for alien genetic systems in alien life that might be living today on Mars, Europa, and Enceladus. The context for this goes back further: When I was a Junior Fellow at Harvard in 1981, I gave a lecture on the history of chemistry to the philosophers of science. Chemistry is only rarely an interest of philosophers of science, who therefore only rarely understand how its history differs from that of physics or biology, which attract more attention in this community. My lecture therefore had to explain to people who were familiar with scientific revolutions in physics; how, for 200 years, chemistry really had not had a true revolution, but rather accreted new concepts on top of old ones, none of them truly incompatible. Synthesis in chemistry has been a very important tool in that process. Synthesis allowed chemists to actually make new forms of the material that was the subject of their field. In doing so, they could test out ideas and theories in chemistry. Other fields have nothing like this. Astronomers, for example, cannot synthesize a new star to test a theory about stars. Until the last 30 years, biologists could not synthesize new forms of life to test their understanding of life. One of the reasons chemistry advanced so quickly was its ability to create new chemical matter. Synthesis created a new direction for chemistry. Originally, organic chemists simply studied the chemistry of compounds from living systems. Here, chemists first isolated compounds from nature, for example, by grinding up leaves, extracting the ground leaves with water, and purifying individual compounds from the extracts. After they had isolated a pure compound, they would burn it, learning from the combustion products (mainly carbon dioxide and water) how much carbon and hydrogen was in the compound. From this information, they would propose an arrangement of atoms in those compounds, that is, the structure of the compound. This is a process of analysis. Next, synthesis was added to the process to prove the structure that had been inferred by analysis: to show that the compound actually had, for example, two carbon atoms bonded to one nitrogen atom, bonded to two hydrogen atoms, and so on. If the natural product could be re-synthesized from those atoms, the analytical inference about the arrangement of atoms in that natural product was confirmed. And, of course, chemists then worked to connect the structure of compounds at the molecular level to the behavior of molecules at the macroscopic level: What color they had, how soluble they were in water, how stable they were and, of course, how might they react with other compounds. This became Structure Theory in chemistry. This kind of analysis today extends all of the way to the human genome, which is nothing more (and nothing less) than a statement of how carbon, nitrogen, hydrogen, oxygen, and phosphorus atoms are bonded in a natural product that happens to support human inheritance. Later, synthesis was used to go further: to get new forms of matter to study so that we could test Structure Theory. The biotechnology emerging in the 1970’s would use synthesis as well, to extend Structure Theory to biomolecules. The first scientists to use the phrase "synthetic biology" in the 1970s were not thinking of making alternative forms of life based on a different kind of chemistry. Rather, they were trying to apply the chemistry research approach to biology: to create new forms of living matter that could then be the objects of their science, as a way of testing hypothesis and advancing a more detailed understanding of that (living) material at the level of the molecule. Luis: Yes, in the 1970s “synthetic biology” was a kind of a general term for what we now call genetic engineering, while the term “genetic engineering” had more explicitly eugenical valences. It’s fascinating how even the most familiar terms can take on very different meanings just a few decades later. Steven: Exactly. Synthetic biology was a way of systematically altering the material under study, to get a deeper insight than was possible from simple observation or analysis, the two research strategies in classical chemistry. Here, the material was different only because it was alive, capable of Darwinism. A major contribution of genetic engineering to this science is the same, even now to the point of re-engineering human cells to test ideas about how they work. But another reason for doing “synthesis” emerged in chemistry at the midpoint of the last century. Robert Woodward offers an example. Woodward synthesized complex organic molecules after their structures were well known, with no question that those arrangements of atoms were correct. Further, the target molecules were accessible without a synthetic effort. For example, with Albert Eschenmoser, Woodward synthesized vitamin B12, a compound that was already available inexpensively by fermentation. The synthesis itself had no practical value. It was not explicitly designed to test a specific hypothesis. Rather, it was simply a grand challenge. Woodward pointed out that pursuing the challenge has value. When they set out to do grand challenge synthesis, scientists force themselves across uncharted territory, prompting them to ask and answer unscripted questions. If the theory that guides the scientists is inadequate or wrong, the synthesis fails and fails in a way that cannot be ignored. Thus, synthesis drives discovery and paradigm change in ways that hypothesis-based research cannot. Woodward emphasized "unscripted." In hypothesis-based research, scientists script their hypothesis, even to the point of examining only hypotheses that are likely to be right. And if they do not, their funding agencies or their tenure committees do. So, the realm of discovery is very narrow for hypothesis-based research. Steven: Yes, but it's more than that. When you sail across the ocean, you can underestimate the size of the Earth. You can land in North America, refuse to believe that you reached a new continent, and call the people living in the place “Indians.” But synthesis in chemistry is strategic and planned and based on theory. It is based on a model for how the world works, and that model guides scientists as they craft their synthesis. If the model is wrong, the synthesis fails. Unlike what you often do when an experiment fails, you can't ignore the failure. The philosopher Willard Van Orman Quine pointed out that there are always auxiliary assumptions in an experiment that make it difficult to disprove a model. Synthesis—grand challenge synthesis, correctly set up, correctly constructed—doesn't let you do that. But it seems that you’re suggesting that the virtue of chemistry as an approach to thinking about “other biological futures”—or “other biological realities” —is that there are well-accepted rules and that chemistry is best-positioned to establish, we might say, that astrobiology is a science with a subject matter and that this is what makes the chemical approach more likely to be successful. Is that a fair characterization? This is a way of knowing that you truly understand the molecular foundations of Darwinism, by getting Darwinism on a molecular platform that is different from the natural platform. A platform that you design. And, if the synthesis fails, you know that you do not, and can identify what parts of Darwinism you do not understand. Luis: This idea that we could find other molecular platforms for life is a longstanding goal in the history of astrobiology. There’s a long history of suggestions that other forms of life are possible, including ones that may not be carbon-based. As Sagan knew, one established genre of these claims is the invocation of silicon—that silicon-based life could be developed on principles similar to carbon-based life. “But silicon can’t be quite right,” everyone then immediately says in the next breath, because of the difficulties of x, y, and z—of exhaling sand, for example. Steven: Do we know who the first person was who suggested silicon life? Luis: I would be curious to know because for decades it has been the throwaway, easy-to-understand example of how life could be otherwise. Steven: There's nothing wrong with this idea. But the problem that we have with people talking about silicon-based life is that you're not having a complete thought. Ask yourself: In what sense are you carbon-based life? Yes, you have lots of carbon, but the other atoms, the oxygen and phosphorus and nitrogen and sulfur, are what gives the carbon its valuable reactivity. The same is true for any silicon-based life form: other atoms will be involved, including carbon, oxygen, and nitrogen. Now, we've tried to make some silicon-containing species, but not by strict analogy to carbon in the biology that you know. Luis: Some other kind of chemical system one could develop or envision that had the capability for, say, Darwinian evolution, but may not be an exact structural replica? Luis: So where does contingency as a central feature of the history of life on Earth fit into the chemical approach that you're suggesting? 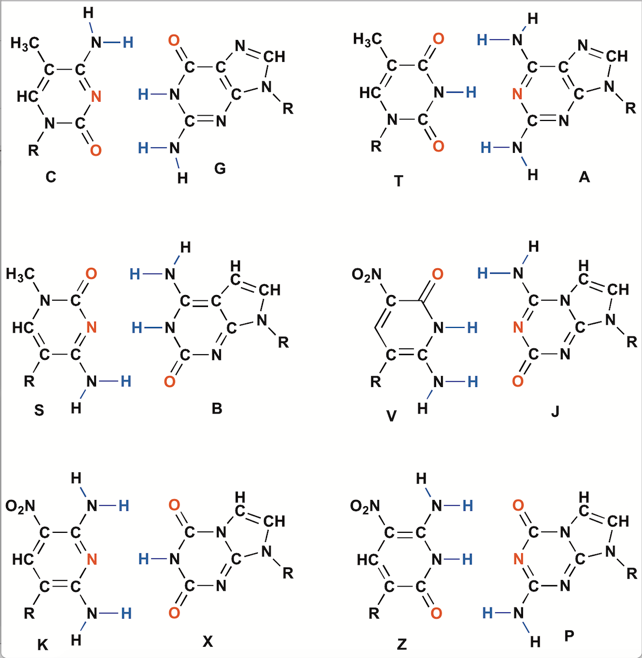 It seems like one answer is that innovative chemistry can suggest that we not try to replicate or imitate life with atom-to-atom chemical analogs, but that we should come up with some other chemical system that presents the features that we're looking for, and that could represent a contingent development in chemical evolution, but that could serve as a basis for a larger biological evolution. Steven: Yes! Keep in mind that you need a theory of life. Jack Szostak, for example, wrote a marvelous article saying we don't have to define “life” to understand how it originated. Now that doesn't quite make sense. But you can tie a definition to a theory, and decide that one thing that makes animate matter distinct from inanimate matter is that it can evolve. I mean “Darwinism” and “evolution”—those two words take a half hour just to flush out what you mean by them, given all the baggage they carry. Luis: It takes me a whole semester! Steven: But if you say, "That's all there is to life," now you have to ask the question: What alternative chemistries could possibly support Darwinian evolution in addition to what you see you naturally? What is “minimalist Darwinism”—perhaps, replication with errors where the errors are themselves replicable? If I construct a system which just does that, will I get out of it all the behaviors that I value in biology? That is one of the questions that drives us in Grand Challenge synthesis. But then you must do more than making Shelley's Frankenstein monsters or the silicon devil in the darkness—the horta—in that “Star Trek” episode, “The Devil in the Dark.” You have to be a reasonably sophisticated chemist to use silicon, to understand the reactivity of these different atomic systems and therefore to generate something that will actually work. Now you're back to the synthesis goal. We think we understand what is necessary to have variation with error, where the errors themselves can be replicated. If our theory is inadequate, as we try to make it do what we value in biology, we fail. And we learn. Luis: What I'm struck by here is that this is almost a direct echo of Muller's arguments in 1926 and later about “the gene as the basis of life.” He had held that in “this ability of the gene to reproduce mutations lies the most essential secret of life itself, and of living matter as compared to lifeless.” You are referencing the same kind of principles of errors with replication. Muller was thinking in terms of genes—which he would only later learn were in some sense sequences of nucleotides—while you’re describing it with the language and context of chemistry. Muller was always in search of the physicochemical basis of heredity: “the biologist tunneling down, and the physical scientist tunneling up, must finally meet,” he once wrote. Steven: Yes, but our thought was now to actually do Darwinism experimentally in the laboratory differently. When I came along as a graduate student, the methodology to do this had been available ten years earlier. But DNA has a structural elegance that is blinding; It was so pretty that few had even thought to try to change it. Fritz Eckstein, was one, also a student of Woodward's. He put a sulfur in place of one of the oxygens in the DNA backbone. Again, a change based on going down the periodic table. He actually got something out of it. But everybody else was thinking that DNA is perfect. One of the fascinating “Aha!” moments that I had when I was a student, was to look at DNA and say, "Wait a minute, DNA is not so perfect. It has a strand that has many negative charges on it, binding to another strand which also has many negative charges on it. That seems pretty stupid." Negative charges repel negative charges, right? Why are you entrusting your genetic inheritance to an interaction between two molecules that intrinsically repel each other? Also, DNA uses hydrogen bonds to hold those base pairs together. But water, where DNA must work, is nothing but competing hydrogen bonds. How crazy is that? And DNA is very flexible. At the time, people trying to design molecular recognition systems were making them rigid, not flexible, like a hand in a glove. Here I am as a student, saying, "Wait a minute, DNA is not an elegant molecule. It violates Coulomb’s law. It uses hydrogen bonds in water. It is flexible." This suggested there were ways to improve DNA. Now back to your question about contingency: if DNA is actually a flawed molecule, in terms of its molecular—shall I dare use the word "design"? Luis: Yes! It's a design journal. We’ll get extra points! Steven: If you think that DNA has all these flaws, you say, "Why is DNA the way it is?" One possible answer is, because of contingency. It got this way early in natural history because of some constraint in prebiotic chemistry, perhaps. Once it was established, despite its imperfections, it was too late to change it. Life was already committed to it. This implies that DNA, or the equivalent genetic molecule somewhere else in the cosmos, could be different. Luis: “Life Forms to be Expected Elsewhere Than On Earth,” as Muller would have put it, with synthesis as a form of exploration. Steven: Exactly. Now, of course, it's not quite a “Columbus” discovery. And it's not what NASA did when they sent Viking to Mars in 1976. Luis: But NASA’s newer focus in astrobiological exploration has been “habitability” rather than “life detection.” How does this relate to synthesis as a form of exploration? Steven: Well, habitability is less foundational. If you think that Darwinism is what distinguishes animate from inanimate matter, that's one thing. But do you believe that water is the only place where Darwinism can occur? When NASA says, "Follow the water," NASA is assuming that the only place that Darwinism can occur is in water. In our 2009 National Academies report , John Baross and I said that life had to have a solvent, and that's because solids don't react easily with solids. But that solvent need not be water. Luis: So your critique of “habitability” as a guiding principle for envisioning or encountering other biologies is that it could, in some future time, come to sound as dated as silicon giraffes walking in front of a camera sound to us now, or as curious as G. G. Simpson’s arguments in 1964 about “the non-prevalence of humanoids” and exobiology as a field “not having proven that its subject matter exists”? The founding frameworks for thinking about what alternative life might be drew on commonsense possibilities that were out there—either in speculative fiction, or simply scientists speculating. 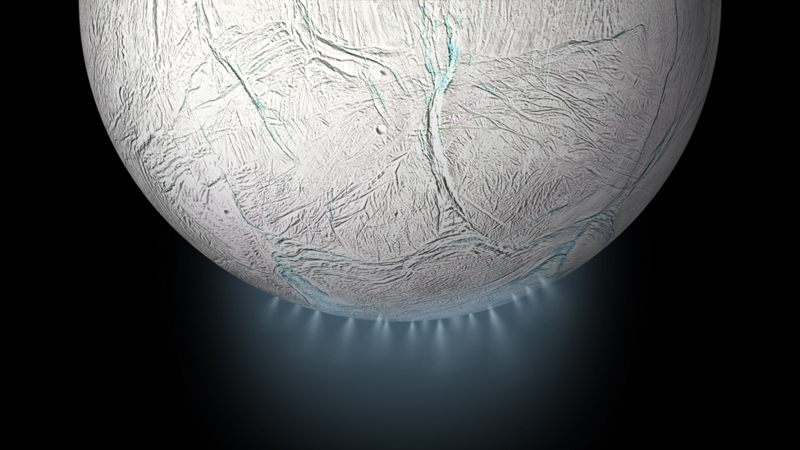 Likewise, the current framework of habitability, of “following the water,” might be just as restricted, but a chemical approach could get us beyond those sorts of assumptions. Steven: I could not have said it better myself. Now, there are some constraints. Habitability is defined in a planetary sense, as allowing you to have liquid water on the surface. Of course, liquid water subsurface, we now know, is equally satisfactory to support life. Luis: If I can “go historical” again for a moment, even the use of the term “habitability” has a really interesting history. Today, if we follow the water, we are looking for liquid water on the surface or subsurface of planets, but if you look at the RAND Corporation report from 1964, “Habitable Planets for Man,” a historical touchstone for contemporary discussions of habitability, it suggests that a habitable planet is “a planet with surface conditions naturally suitable for human beings, that is, one that does not require extensive feats of engineering to remodel its atmosphere or its surface that people in large numbers can live there.” Habitability no longer has that colonial association. We’ve lost these other dimensions in how we frame the discussion of habitability today, as we focus on the chemical, physical, and planetary possibilities of life. That familiar territorial, Columbian metaphor of earthly contact is also at the root of legal considerations that first emerged in the 1950s, as scholars in “space metalaw” began to think about what our obligations or tactics or strategies should be in the event that we encounter other forms of life in other places. It’s obvious to the historian that emerging astrobiological concerns about forward and back contamination in planetary protection—about maintaining separate spheres, about contamination and containment—are clearly echoing a Cold War world. When we imagine new ways of doing science, our speculation is constrained as much by our social context as by the principles of our science. Steven: And by the physical context and alien environments where alien life might have originated. Other planets, even in our own solar system, have different geologies, different mineral assemblies, and different environments throughout their history. We can build alternative genetic systems in the lab, but now we must ask whether or not a geological environment existed where those would emerge and stick, in their independent origin of life? Luis: May I riff on this idea of different environments making different futures for life possible? Luis: I’d like to suggest that divergent interpretations in science emerge in part because of the different environments in which scientists are doing their work. If we look at Darwin and the theories he presented in the Origin of Species, we are confronted with the metaphors he uses to share his understanding of evolution, and these metaphors can operate in lots of different ways. He talks about the entangled bank of a river, where a variety of plants are all struggling for sunlight, as a form of struggle for existence. And yet he also talks about a lone plant growing at the edge of a desert as also struggling for existence. These competing metaphors for the same scientific concept of Darwinian evolution led to the possibility for radically different interpretations in different national contexts. In Britain, you have an idea of competing against other organisms, which fits a vision of industrial Britain as crowded, and with elbows-out everywhere—an entangled bank of organisms, struggling for sunlight. In Russia, it's the exact opposite: it’s not competition that matters, but cooperation in the struggle for existence against a harsh environment. In Germany, the word “evolution” has all sorts of embryological connotations and seems obviously related to developmental patterns (“ontogeny recapitulates phylogeny”). And in France, where Lamarck’s transformism had long been known, Darwin seemed to some to just be a footnote to Lamarck. So, what is Darwin’s theory? What is the Darwinian Revolution? What does knowing this history mean for using “Darwinian systems” as a concept in synthetic biology or astrobiology today? If we understand “Darwinian systems” to be a coherent concept, then we’re going to design experiments around it that result in clarity. All we have to do is think about the different geological circumstances and different environments, ascertain whether it will be hydrocarbon-this on Titan or something else on Mars, and compare our understanding to the earthly context we know well. But the historian of science always needs to ask: Well, what about the contingent social circumstances that surround these varied approaches? Is it possible that a later historian of synthetic biology and astrobiology will come to look at this particular moment and see “English” versus “Russian” versus “German” versus “French” approaches? Even if, to each practicing scientist today as in the late nineteenth century, the aim is to show how nature is, which they often see as having little if anything to do with the social context in which the scientific work is being done. Steven: So you mean to tell me that you believe that my alien life is going to be different because I'm a cash-loving American and not a cheese-loving Frenchman? Luis: What I'm saying is the historian’s methodological principle is that science is done in a time, in a place, by people who live in a culture. And is it possible that these various contexts affect, condition, or constrain the sorts of interpretations we put on the work that we do as scientists--that not only our speculation is constrained, but even our science itself? This social component is surely not as easily reducible to “cash-loving Americans” and “cheese-loving French.” But were the scientific community composed or structured differently, what other biological futures might emerge? Might other frames challenge our assumptions, assumptions we don’t even know we have? Might we move past “habitability” or any other dominating framework towards something else? Steven: It's an interesting thought. I’ve put together a workshop on the origins of life in October 2018. It'll be interesting to see whether any of the Darwinian intellectual diversity that we would say is necessary for progress is represented here. It'd be nice to be a fly on the wall with your perspective as a cultural historian, to see whether you can detect cultural differences. Luis: And how might the opening-up of spaces of production of scientific knowledge to outsider-insiders in science, to historians or other humanists, to speculative thinkers or writers, affect the constraints we have on speculation? Steven: You might get the same effect by someone like yourself showing up from outside the community, who hasn't read the chemical literature but knows enough to comment strategically on the cultural similarities that are preventing our progress. The workshop is certainly representative: on geography, gender, race, and different kinds of immigrant experiences. The question is whether we have the intellectual diversity that we need. Luis: But it’s more than checking boxes about people’s identities. In what ways are these contextual features actually constitutive of the science itself, of the content of our knowledge? This was the hard case for the sociology of scientific knowledge as it first emerged in the 1970s: not only to talk about how many people in the field had degrees, or how many women were in the field, or the difficult but important work of gathering such statistics, but to appropriately question and show how the context in which work was done—or the person doing it—was actually relevant for the production of knowledge. That identity or context was not something to merely be abstracted away, as scientists often necessarily do in the course of their work, but could, in fact, help us to understand why the science in a particular time and place looks the way it does—and to do so in a way that moves beyond demographic enumeration. Steven: That's very interesting. I often engage with philosophers and historians of science. I even had one writing me and treating me like an experimental object. We were the lab rats being studied by the anthropologists of scientists. Luis: It is. You know, when you read other people's mail from decades ago, it just takes you places you wouldn't believe. Steven: (laughing) Well, the point is that when you're searching for alien life on Mars, your search strategy is constrained by your familiarity with terran life; you will find Martian life only if it resembles terran life. But of course, when you're synthesizing alternative life forms in the lab, the risk is that you will make only alternatives that resemble terran life. Your synthesis strategy is constrained by your awareness of the terran life. Luis: And by your imagination. Luis: There's the giraffe again. Steven: At least with macro giraffes, even if they're made of silicon and arsenic, you see them walking. But we would have a hard time recognizing the molecular system of an even modestly exotic life form at the molecular level, because the tools you use for analysis are particular to the material being analyzed. For example, a silicon-arsenic giraffe would not combust to give carbon dioxide and water. Thus, if you take one of the alternative genetic systems that we have been designing in the laboratory, drop it on Mars, and ask NASA to find it, they could not find it with the instruments that they're using. From a taxpayer’s perspective, that’s frightening. You spend all this money to go find habitability and you’re thinking “water,” not recognizing that even in water, some Darwinian molecules might be invisible to your instruments. And still worse, there could be a system that lives in something other than water. Water is barely a liquid on the surface of Mars. Instead of looking for water, maybe you should be looking for formamide, which can be a liquid at the low atmospheric pressure of Mars. But you want to find water because that’s what the public is interested in, knows about, and familiar to them. And the public is interested. You can get into a taxi in New York City or San Diego and they know about NASA, they know about the launches, and they're interested in knowing whether there's life there. Luis: And that kind of “taken for granted-ness” of our cultural context, of what counts as a good explanation, is, I think, what is interesting about the history of science. When we started our conversation, you suggested that chemistry hasn't had the kind of substantive transformations that other fields have had—that the rules have remained mostly the same. I wonder if there might be ways in which things that are taken for granted, or not taken for granted, by different generations, by different practitioners, can make other biological futures attainable or realizable. Steven: Expand on this, because clearly I'm being caught recognizing that I don't have the cultural context to even recognize the question that you are asking ... it never occurred to me before. How about that? Luis: I guess you're finding yourself in the position of the laboratory rat again. Steven: We get well fed. Luis: My goal as a historian of science is not simply to reconstruct a chronology or a genealogy of who did what when, or a “great man” history of science, but to have a method that looks to identify how context might actually inform content, and then to poke around and explore and see what sort of case might work best to make that argument. When I look at debates about evolutionary history and humanoids in the 1950s and early 1960s, when UFOs were all the rage, and how this is related to the development of space metalaw, and how this morphs into the “prime directive” in Star Trek and the development of “planetary protection” in NASA… it's fascinating to see these associations that, were you to mention them to a practitioner in the field today, might simply sound absurd. But these strange bedfellows are interrelated in ways that we've lost sight of and which actually helped produce the science of the age. And by reconstructing those stories we are able to learn how science actually transforms with the culture around it. I know you’re big on scientific method. What I find most interesting about this kind of historical method is that, like scientific method, I don’t necessarily know what I’m looking for when I begin. But by digging into the archive and thinking through the larger context at that time and connecting that context to the scientific claims being made, you can find some really cool things. In Radium and the Secret of Life, it’s what led me to uncover a deep association between radium and life a century ago, when people thought radium was good for you and they drank it and danced with it and used it in experiments. Radium would have been more present on the early Earth, they claimed, and so we get the first experiment in the historical origin of life on Earth—that life may have emerged as a result of the action of radium on the primordial soup. Although the depths of association between radium and life are almost inconceivable to us today, they actually led, in Muller’s hands in later decades, to some fairly fundamental insights into the structure of the gene. For me as a historian, the joy is in uncovering how the most surprising stories exist behind the science we know today—and uncovering it in a way that the science itself today would never have led you toward or to expect. Steven: One thing that is relevant here in my personal story is not having a funding concern. If you go back to my research notebooks, you will find pages written in November of 1985 where the artificially expanded genetic alphabet is laid out in detail, with people signing the notebook because I was expecting this to have patent value, which it has. It’s been incorporated into diagnostic tools, viral load measurement and more. But when I was just 29 years old, the Swiss Federal Institute of Technology brought me to Switzerland and gave me the funds to do pretty much whatever I wanted. And so the extra letters in the genetic alphabet, the resurrection of ancient genes and proteins from now-extinct organisms going back billions of years, the evolutionary bioinformatics stories that organized the genome sequences, all of this was done without competitive peer review. And I think it wouldn’t have been done with competitive peer review. I did have a proposal to do total gene synthesis back in 1984, which was severely rejected by an NIH panel. We went ahead and did it anyway with NIH funds that had been assigned for a different project, and published it in Science, which the NIH then castigated me for. And that's what put me on an airplane to Switzerland. Luis: But it is an argument for the role of contingency in social context as a factor in the development of scientific knowledge, right? So, you’ve narrated contingency here as a fact of your life. For the historian thinking about the sorts of futures we can envision, the autobiographical factors are just as relevant as the chemical ones. Steven: It's also geological, natural-historical, and planetary contingency, right? If all planets able to support life have the same early natural histories, in which case the contingencies as they constrain chemistry would all be the same, then this would explain why all Star Trekaliens look like Hollywood actors with prostheses. But we don’t know the diversity. In our own solar system, we do not have a diversity of planetary origins sufficient to cover all possible environments where life could have emerged. Luis: I'm suggesting that all of these ways of our thinking toward “other biological futures” are interrelated. The chemical arguments you've made about how one can use synthesis as a mode of exploration are as fascinating to me as the metaphors you used to describe it. And your contingent autobiographical story is as important to consider as larger institutional or national questions about science policy, how funding is distributed, what counts as an acceptable project—all the many things that affect the development of a research agenda, or a field, or a culture. Other biological futures are never to be found just in the laboratory—or on other planets!